AleaSoft, June 11th, 2018. 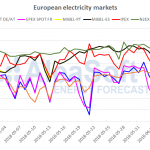 Prices have remained high in the main European markets this last week due to low renewable production, several unavailabilities and fuel and CO2 emissions rights prices that remain high. The return of unavailable power and the increase in wind energy production will moderate the markets prices this week. 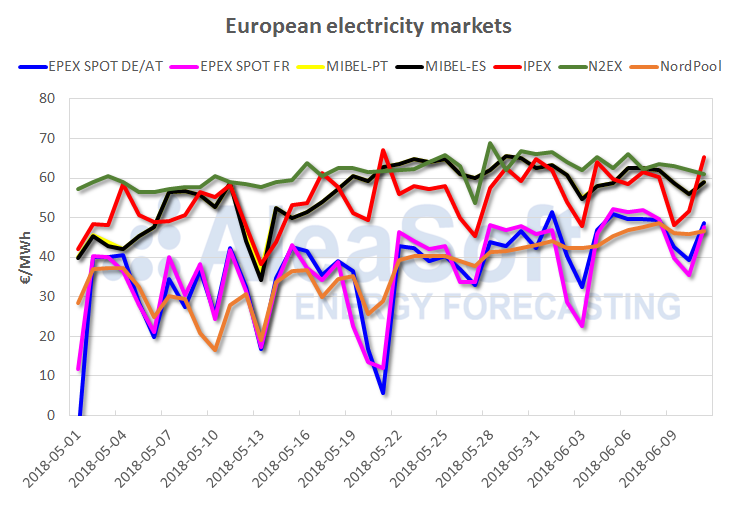 The last seven days in the main European electricity markets have been characterized by high prices (Iberian market MIBEL, Italian IPEX and British N2EX) or by a clear upward trend (EPEX SPOT German and French markets, and Nordic NordPool). AleaSoft considers that the main causes of these high prices are the unavailability of production units in several countries, low renewable production (mainly wind energy), and high fuel and CO2 emission rights prices. During the last week, all products of the OMIP futures market for the Spanish power receded, mainly for delivery in 2018. 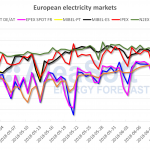 In the rest of European electricity futures markets, the general trend has been a stable behavior. In Spain, this last week, the unavailability of up to three nuclear power plants has continued for a few days. Ascó II nuclear power plant was working on Sunday and last Monday at 60% of its maximum power but had to stop again due to a leak detected in a water pump. On Thursday, it started again and has been operating at its maximum power since then. The peninsular wind energy production has remained low as in the previous week, at levels 45% below the usual at this time of year. Temperatures, slightly lower than usual, modestly moderated the peninsular demand. For this week, no major unavailabilities are expected, and the reincorporation to the network of two nuclear reactors in Germany is planned. In addition, temperatures will continue moderated for most of the week, so there is no expectation of an upturn in demand. Along with the expected increase in wind energy production, AleaSoft estimates that prices will moderate, although they will continue at high levels above 50 €/MWh in the Spanish and Portuguese electricity markets.